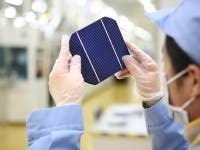 JA Solar multicrystalline solar cell achieves record efficiency of 18.3%. JA Solar has reported that it has achieved a record 18.3% efficiency for a standard 156×156 mm2 multicrystalline solar cell. This was verified by Yangzhou Opto-Electrical Products Testing Institute. This is twice as efficient as my solar panel. Solar cell and solar panel efficiency isn’t as big an issue as some have made it out to be. However, efficiency improvements open new windows of opportunity, such as the ability to extend the battery life of portable electronics such as cellphones, tablet PCs, and laptops. There is also the issue of cars and planes. Highly efficient solar panels could make solar-powered planes and solar-powered long-range electric cars much more feasible. Solar-powered cars would charge in almost every parking lot during the day, and reduce the current required from the grid to charge as well, reducing the cost of charging and emissions, if the grid power in their area comes from fossil-fueled power plants. In other words, the more efficient the solar panels that can be integrated into these devices, the more power they can generate. JA Solar said that it intends to move its record solar cell from the R&D to the mainstream volume production stage. In respect to other tier 1 PV manufacturers, JA Solar was only ranked 11th in terms of R&D spending (US$13.9 million) in 2012.